Rock Steady Keeps Hitting Hard! 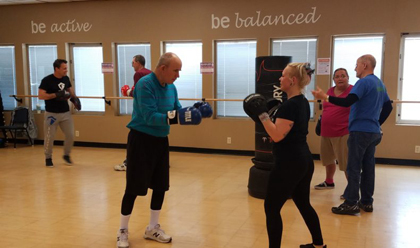 April is Parkinson’s Awareness month and marks a one year celebration at your Ottumwa Family YMCA for our Rock Steady Boxing program! This program is a health and wellness boxing program designed specifically for people fighting Parkinson’s Disease. Parkinson’s disease is a degenerative movement disorder which can cause deterioration of motor skills, balance, speech and sensory function. The Parkinson’s Disease Foundation estimates there are more than 1 million people in the United States diagnosed with Parkinson’s disease, and more than 60,000 people are diagnosed each year. 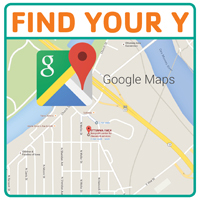 The Ottumwa Family YMCA decided to help local individuals fight back against Parkinson’s disease through this amazing program! The programs exercises are largely adapted from boxing drills. Boxers condition for optimal agility, speed, muscular endurance, accuracy, hand-eye coordination, footwork and overall strength to defend against and overcome opponents. Through Rock Steady Boxing, Parkinson’s disease is the opponent. Exercises vary in purpose and form but share one common trait: they are rigorous and intended to extend the perceived capabilities of the participant. If you might be interested in the program or know someone who would benefit from it or would just like some additional information on this program, please contact Kathy S, Wellness Director, at the Ottumwa Family YMCA at 641-684-6571 ext.26. Previous post: Y Youth Breadgineer Winners! Next post: Healthy Kids Day 2019!